One of the best Bangkok Flower Markets is known as Pak Khlong Talad and it's where you will find not only the very freshest roses and orchids but a whole variety of flowers that you might not have seen anywhere else in the world. This particular big and bright market is by far the best that you will stumble upon in the city. The market is located on Chak Phet Street near the Memorial Bridge at the northwestern edge of Chinatown. Close by is the Erawan Shrine Buddhist Memorial for those of you who would like to say a prayer and perhaps leave a small offering. The best time to visit the market is late at night or the very early hours of the morning when it is still dark. You will find an amazing array of absolutely beautiful fresh flowers, as well as a vast assortment of fresh vegetables at this sometimes crowded riverside market. With the sweet smell of jasmine, marigold and lily filling the air and with more orchids and roses than you will ever see in one spot, you should be blown away. For someone like myself who rarely bothers with flowers, I was truly bedazzled. You will be amazed at all this colour that surrounded you. For flower lovers, this market should not be missed at all. Many of Thailand's flower growers arrive at the market daily to come and sell their wares here. Talaat Thewet Flower Market is another excellent market to visit for all gardening accessories as well as tropical plants and seeds. 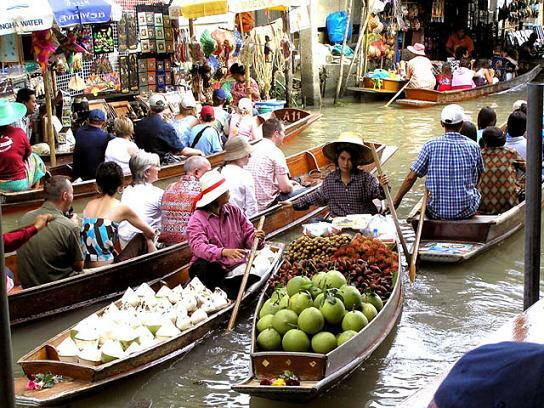 You would need to take the express boat on the Chao Phraya River. Ask to get off at Thewes Pier. This tourist friendly market is not at all crowded as some of the others markets are. They are open daily between 9.00 am and 6.00 pm. Pat Phone Flower Market is another night flower market in Bangkok where you will find a variety of exquisite orchids and other exotic flowers and plants. Souvenirs of every description are on offer as are the various vendors selling several kinds of hot and cold street foods! They are open daily except on Wednesdays.